Removing unwanted body hair is a chore. No matter how often you pluck, wax, tweeze, or shave, it relentlessly returns. Both men and women struggle with the regular battle against hair growth. If you are ready for a more lasting solution, laser hair reduction is the only FDA-approved method for permanent hair reduction. With a state-of-the-art laser, hair follicles can be destroyed, keeping the hair from ever growing back. This system is safe for all skin types and can be adjusted for customized treatment. The intense light of the laser is absorbed by the melanin in the hair and transferred into heat. This destroys the follicle without harming your skin. The process is non-ablative and non-invasive. Most patients can tolerate it without any kind of pain relief. The sensation is similar to the snap of a rubber band against the skin. Hair grows in phases, and laser treatment is only effective during the growth phase of the hair. Most people need between 6 and 10 sessions to achieve their desired results. 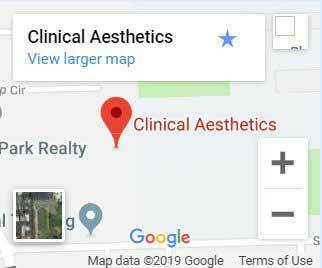 If you are looking for a permanent solution to unwanted hair, contact Clinical Aesthetics and make an appointment for your laser hair removal consultation today. Register to Receive Special Monthly Offers! When you sign up for our newsletter you will get access to our monthly deals. For this month, we are offering $25.00 off first custom facial for new aesthetics patients. Clinical Aesthetics is a modern medical spa offering a wide range of skin care treatments. Dr. Kathleen Gallaher and her team combine science with beauty and help you relax and look amazing.